Child Abuse - Are You Unknowingly Abusing Your Children? Most parents are aware of the rampant rate of child molestation and abuse and as such, take strong measures to protect their children against it. 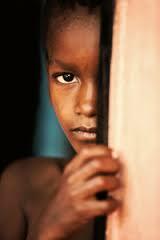 However, some parents unknowingly abuse their children themselves in a very subtle manner that is quite widespread. 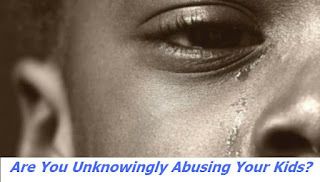 I want to share about the emotional abuse of children. Most of us have imbibed the harsh African culture of talking strongly to our children. In trying to keep with the biblical injunction not to spare the rod, we sometimes go overboard. Emotional abuse often stem from a cycle; people who were raised in verbally charged and emotionally abusive environments meet out the same treatment unconsciously to their own children. This means most of us are prone to abusing except we deliberately make the choice not to. If you grew up in a household where screaming or violence was the norm, you may not know any other way to raise your kids. Judgment, blame, shame and guilt-riddled verbal attacks are destructive, with unwanted consequences. More importantly, this method does not teach children how to reflect on their behavior. When you speak to a child, be aware of your tone, attitude and body language. What are you communicating? Are you tending a space ripe for breeding negativity or one where positivity can flourish. Repeated disregard for children's feelings and needs, in favor of demanding obedience and compliance with adult requests can delay and alter emotional development and intelligence. When you allow your own parenting stress, fears or unconscious habits to influence how you react or treat your children, you risk teaching them the same negative behaviors that you try hard to erase. 1. Ignoring or abandoning them while you watch movies, play games or surf the Internet. This is currently the most common form of abuse and neglect. 2. Shouting too much about everything. Always appearing angry and impatient. 3. Using abusive language, calling them names or attaching labels such as “Stupid” or “Lazy”, or phrases like “good for nothing”, “You’ll never amount to anything”. 4. Sexualizing your children through age-inappropriate clothes, exposure to sexually explicit music and dance, exposure to age-inappropriate films, conversations and habits. 5. Comparing them unfavorably with others, especially their siblings. Saying things like “If you could only be more like your brother”, and “You can never do anything right”, etc, can tear at a child’s self-esteem. 6. Threatening them with abandonment, disownment, chasing them away, arresting them, etc, as a means of scaring them. 7. Threatening them with bodily harm, or even to kill them. Saying things like "I brought you to life and I will take you out". 8. Withdrawing benefits, toys, etc, for minor offenses and without proper explanation. 9. Blaming them for your state in life, your financial problems, marital problems, weight problems etc. 10. Denying them food or benefits that you can afford. 11. Publicly humiliating, embarrassing or ridiculing them. Children can be very sensitive and such public displays can tear at their self esteem. 12. Beating, Flogging or Slapping them for flimsy reasons, using excessive physical discipline. 1. Is excessively withdrawn, fearful, or anxious about doing something wrong. 2. Shows extremes in behavior (extremely compliant or demanding, extremely passive or aggressive). 5. Avoids own parents - prefers to stay alone, shows poor social skills. What You Can Do to Prevent Abuse! 1. Tell them you love them. Shower them with love, not only on birthdays or at Christmas but make it a lifestyle. Let your children know without a doubt that you love them. 2. Display affection towards them. This is important for both parents equally. Hug them often, give them kisses on their forehead/ cheeks, give them a Hi-five, a squeeze of the hand, a pat on the back, etc. Physical contact is important for children's emotional development. 3. Spend time with your children, irrespective of their age. Put your phone away, get off social media, switch off the game and talk with them. Tell them stories, play games with them, go out with them, teach them the principles of life. 4. Never compare them with their siblings or others. 5. Never be ashamed to apologize to your children. If you lose your temper and say something in anger that wasn’t meant to be said, apologize. Children need to know that adults can admit when they are wrong. 6. Address the behaviour that needs correcting and use appropriate discipline techniques, such as time outs or natural consequences. Be sure to discuss the child’s behavior and the reason for the discipline, both before and immediately after you discipline. 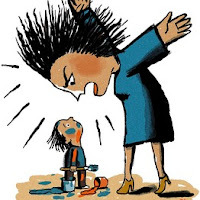 Discipline should be provided to correct children's behavior, rather than to punish or humiliate. 7. Compliment your children when they accomplish even small tasks, or when you see good behavior. Compliment them on their clothes and when they look nice. Compliments help to build self esteem. 8. Never react to them in anger. Walk away from a situation when you feel you are losing control. Isolate yourself in another room for a few minutes or take a few deep breaths before reacting. 9. Learn what is age appropriate and what is not. Having realistic expectations of what children can handle at certain ages will help you avoid frustration and anger at normal child behavior. For example, toddlers are not going to be able to sit quietly for extended periods of time. 10. Learn new parenting skills. Most of us became parents and played it by hand, very few took time to learn about parenting or read books, so we are basically repeating what we saw our parents do. Buy books, read blogs, articles, etc on parenting, learn tips from other parents as well. 11. Take care of yourself. If you are not getting enough rest and support or you’re feeling overwhelmed, you are much more likely to succumb to anger. Sleep deprivation common in parents of young children, adds to moodiness and irritability—exactly what you are trying to avoid. 12. Get professional help. If you are having a difficult time breaking the cycle of abuse and can’t seem to stop yourself no matter how hard you try, it’s time to get help, be it therapy, parenting classes, or counseling. There are certain free professional counselors who can help you. Your children will thank you for it. Finally, raising children is one of life’s greatest challenges and can sometimes trigger anger and frustration in the most even tempered. If however, shouting, abuse or neglect is more of a lifestyle, then you are most likely abusive to your children. Can you relate with some of these descriptions? Are you struggling with one of these issues or have you overcome it? Please share your experience, suggestions or thoughts with us.